We've developed 5,000 megawatts of clean, renewable energy worldwide. Located in northwestern Indiana, Benton County is one of the state's leading agricultural communities. It’s 97% farm land, so nearly everyone works in agriculture or provides services for those who do. But in 2008, Benton County embraced an entirely new industry when its citizens worked with us to build Indiana's first wind farm. We partnered with landowners and with power purchasers Duke Energy and Vectren to create a new economic engine for the community. A decade later, we continue to operate the project which has generated more than $4 million in local tax revenue, $6 million in payments to local landowners, and $45,000 in scholarships for local high school students. One of our landowner partners in the project, the Caldwell Trust, is a non-profit home for elderly women. To date, the project has generated more than $600,000 in revenue for the Trust from wind turbines built on their land. Castro County Texas lies 70 miles southwest of Amarillo. Though the community and wind farm lie far from Silicon Valley, in 2017, they helped Google mark a major tech milestone. The Bethel Wind Farm was one of the final steps in Google reaching its goal of 100% renewable energy for global operations. Orion developed the project and it is now owned by Southern Power, who sells most of the power to Google Energy. But it's not just Google and Southern Power who have benefitted. Local residents have seen a new, long-term and reliable source of revenue flowing into the community. Sherman County sits in north central Oregon and is home to only 1,700 residents but, thanks to the Biglow Canyon Wind Farm and other wind farms in the county, it's now the largest producer of wind energy in the state. This project was built in three phases between 2007 and 2010 and is owned and operated by Portland General Electric Company. The wind farm provides enough electricity to power 125,000 homes served by the utility. While many people associate giant tech companies with Silicon Valley and the West Coast, much of the power that runs their servers comes from the winds that blow across the central U.S. Sixty miles southwest of Chicago, this project in Kankakee and Iroquois Counties has been supplying electricity to Microsoft’s Chicago area data center since 2015 and, in addition, is providing a significant boost to this rural economy. Orion developed Pilot Hill with local development partner Vision Energy, and the project is now owned and operated by EDF Renewable Energy. Located in southwestern Indiana along the Ohio River, Spencer County is home to Lincoln’s boyhood home, farming, energy production, and the town of Santa Claus. The county seat, Rockport, is the southernmost city in Indiana. The solar array will be situated on approximately 300 acres and will consist of about 150,000 solar panels. The array will be mounted on a single-axis tracking system, which enables the panels to automatically pivot to enhance energy generation as the sun’s rays move across the surface of the Earth. The facility, which should be fully operational in the fall of 2020, is expected to generate enough power to meet the needs of more than 11,000 households per year. Orion Renewable Energy Group developed the project, First Solar will supply solar panels and perform construction, and Vectren will be the long-term owner. 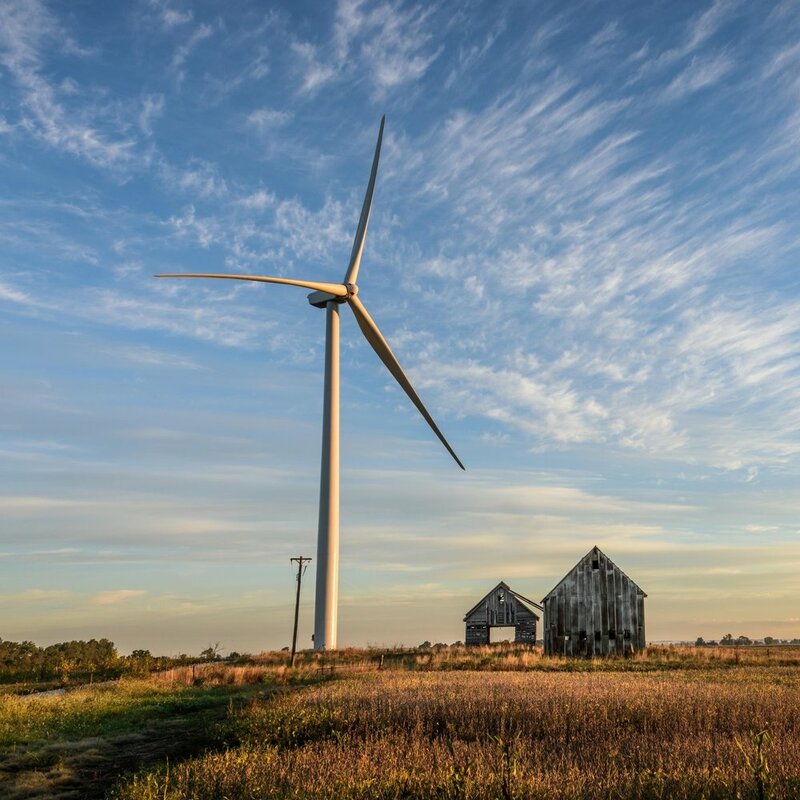 The residents of Stark and Marshall Counties in north central Illinois have discovered that the construction and operation of a wind farm can have a profoundly positive impact on their communities. Over the past decade, while farmers have continued to grow corn and soybeans right alongside the wind turbines, the Camp Grove Wind Farm has generated more than $10 million in property taxes and $10 million in payments to local landowners while the community's high school students have received $80,000 in college scholarship funding. Farmers in Stark and Marshall Counties have welcomed wind as a drought-resistant crop. “Stark County would have gone bankrupt if it weren’t for the wind farms. Within two weeks of being built, 99% of the turbines were producing energy just like they said they would and have ever since. Orion was always honest, always true to their word. They’re the greatest corporate neighbor we could have had.” — Tom Howes, Sr. Member Stark County Board. We developed and built the project and continue to run its operations, selling the electricity to Appalachian Power and to PJM, the regional power grid operator.